Spend the day learning more about the mysteries of Ancient Egypt in this wonderful Kent Castle. 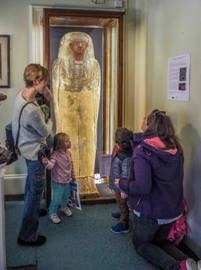 There will be something for all ages on Egyptian Day including handling objects 3000 years old and listening to talks by a Professor of Egyptology. Meet Irethoreru - that’s the newly-discovered name of the 2600 year old mummy that would have been inside the Castle’s Ancient Egyptian coffin lid exhibited on the Great Hall Gallery! Don't forget to visit ‘The Fields of Eternity’ - the Castle's unique, award-winning Ancient Egyptian-themed conceptual grass maze too! All activities are included in the usual Castle admission fee except face painting when a small charge will apply. The event will take place on Sunday 13 August between 11am and 5pm. The Castle will also be open for visitors to explore the exquisite Japanese and Egyptian museum Collections of the late owner Denys Eyre Bower together with Buddhist and Stuart treasures. Explore the original Victorian rooms inside the Castle, including the large kitchen and servants’ quarters, and enjoy reading about the colourful and eventful life of Denys Eyre Bower in his study.